Yesterday, Long Island City, New York-based, Ravel Hotel LLC filed an Adversary Complaint against Revel Entertainment Group, LLC and Revel Group, LLC. The Complaint, filed at the Bankruptcy Court in New Jersey, alleges trademark infringement and seeks injunctive and monetary relief. The Plaintiff is represented by McCarter & English, LLP. 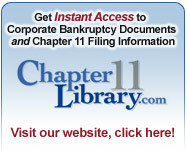 Debtor Name: Revel AC, Inc.
Let us help you monitor new Chapter 11 filings. Sign up for our daily list today! Contact Ken at ktroubh@nationwideresearch.com for details.